* Speaking of Woodhead, who has gotten a lot of work the first day-and-a-half, Ryan said Woodhead reminded him of another undersized player he knows. Ryan, of course, meant it as a compliment as his affinity for Leonhard is well documented. Part of what's helped Ryan shake things up is that three players who know him from Baltimore came with him. Linebacker Bart Scott, defensive end Marques Douglas and safety Jim Leonhard all are familiar with Ryan, his system and his quirky ways. And Ryan thinks that's helping him. 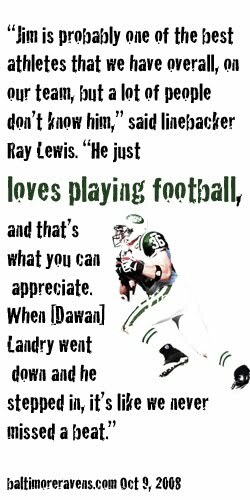 "I mean, besides the fact that they're all pretty good football players, it's great," Ryan said. "It's not only that they know the system, but they know how things are done, what the expectations are and understanding that we don't accept anything but that. There's certain rules that we have to be a defensive player, to wear that decal that says 'New York Jets' on it. You've got to play to a certain standard. Certainly, these players play to that, and the guys are noticing it." In other words, things can be as loose as you want them to be when you have smart, professional veterans setting the example where it counts. The players that came from Baltimore, who played in last year's AFC Championship Game, have helped the coach bring a swagger and a new attitude, but it's all rooted in the fact that nobody has to doubt whether they're working hard. "You can come in and be loud and be boisterous and whatever, and believe me, that's what we're going to do," Scott said. "But when you do that, people can tell whether it's just talk or whether you can back it up. People can see which kind of guy you are. And if you can't back it up, you're not going to last long." It's April. It hardly gets any earlier. But things are off to a good start at Jets camp. A fun start. What a concept.